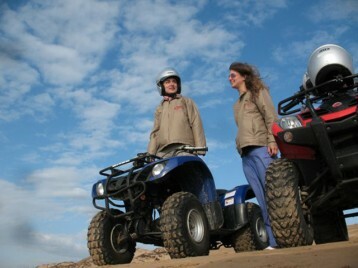 With a passion for nature and motor sports, Palma Quad offers you an experience without equal in the Essaouira region. Led by Berber staff from the area who have in depth knowledge of the local terrain, you will experience nothing like it. Our programme offers you the chance to discover quad-biking in harmony with nature, with each excursion tailor-made for your age, physical aptitude and level. We offer you cross-country excursions to exceptional places and we are fully committed to offering our clients the best possible experience. Our Discovery package is the best cross-country quad-bike offering in our region. trips � a wonderful way of combining deserted beaches, forests and endless dunes. For those who are passionate about quad-biking and who would like to see what more our terrain can offer, we have several cross-country excursions which include visits to local villages, giving our clients the opportunity to discover Berber traditions while sharing a meal in a restaurant or in a local home. PALMA QUAD ESSAOUIRA.PALMA QUAD ESSAOUIRA. Direct payment to owners PALMA QUAD ESSAOUIRA.